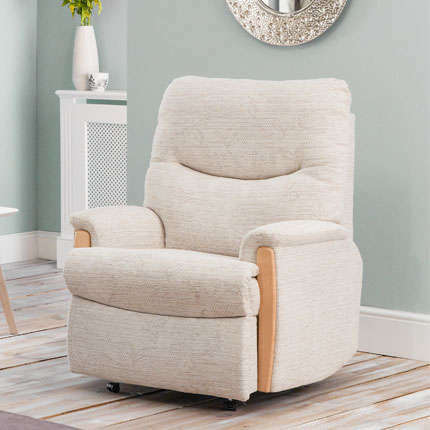 Our newest and most contemporary collection the Melton features a simple, supportive, back design with square padded arms. And for that extra touch of style each piece can be supplied with a choice of two colour options of real wood fascia (Natural or Medium Oak) or if preferred coordinating fabric fascias are also available. The Melton collection offers a choice of a matching 2 or 3 seat, fixed or reclining settee and fixed chair to make the ideal suite for today’s modern, contemporary home. We offer Two Man Delivery as standard. As with all Celebrity recliners this comes with a full manufacturers 5 year guarantee on motor, action and frame. Other than the Celebrity recliners that we carry in stock, all orders for Celebrity recliners and sofas are personalised items, made to order. You choose the style of chair, size of chair, wood colour (if applicable), fabric colour and whether to have castors or glides. You also have the option to choose to have the fabric stain protected. Due to this the item is classed as a 'Personalised Item' and as such we do not accept return under The Distance Selling Regulations 14 day cancellation rights. If you feel that you may need to return a chair under the 14 day cancellation rights of the Distance Selling Regulations, please ensure you only purchase a chair from stock and not one that has been custom made / personalised for you. Stock chairs are clearly marked in the description with the words 'Stock Item' and your order confirmation with also state 'Stock Item'. Your statutory rights are not affected. Depending on where you live, delivery of this Celebrity Melton Recliner Fabric will be made by either our in house delivery team or our one of our specialist couriers. You will be advised which method is being used when we arrange delivery. We will do our best to ensure that your Celebrity Melton Recliner Fabric is delivered on the date agreed. There are times however when this is simply not possible due to unforeseen obstacles encountered by our drivers, whilst attempting to deliver the order. If the customer is not available when we attempt delivery we will return the goods to our warehouse and a new delivery date will need to be arranged.